In 1927, at the peak of the Independence Movement, American historian Katherine Mayo visited India and soon after published a book called Mother India in which she derided Hindu rituals such as infant marriage and sati [self immolation of widows] and the general status of women in Indian society. Soon notorious for its racist and imperialist connotations, the book evoked fierce criticism from Indian nationalists over the now familiar critique of its depiction of the phenomena of ‘white (wo)men saving brown women from brown men’. Today, there is much to reflect upon in post-colonial Pakistan when feminists who draw global attention to cases of gender abuse are warned not to ‘wash their dirty laundry in public’ and are routinely labelled ‘native informants’ and ‘imperial collaborators’. 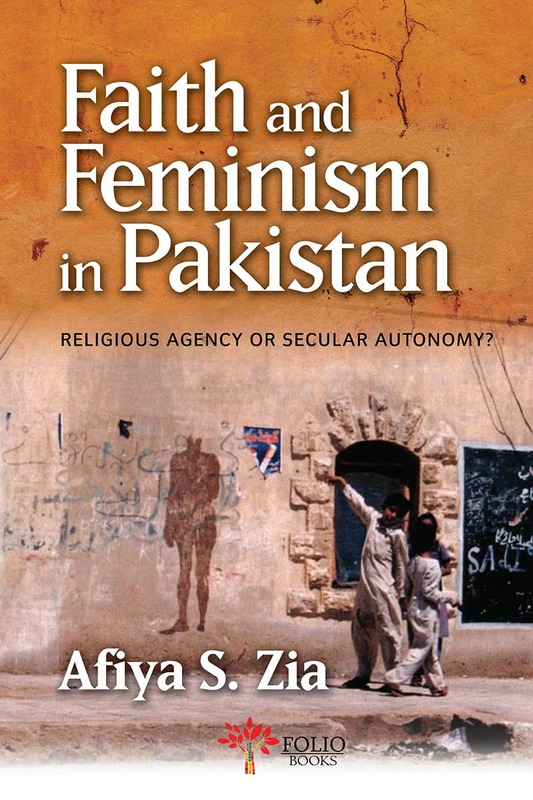 Afiya S. Zia’s brave and insightful book, Faith and Feminism in Pakistan, draws attention to the history, achievements and threats faced by the secular feminist movement in Pakistan today. In this welcome intervention in the field of gender in South Asia, Zia attempts to challenge a dominant historiography that she claims has failed to recognise the potential of feminist movements in Pakistan. Stating that her aim is “to recover the worth, value, contributions and viability of secular feminism in Pakistan both historically and with reference to the future”, she draws attention to the resilience of secular resistance in the face of the state and of private Islamist franchises. Lamenting the limited research in Pakistan on feminism and women’s movements in Pakistan, Zia points out that much of the literature on this subject employs a false ruptural view of the evolution of feminism in Pakistan as it has been produced after the so-called ‘War on Terror’. This has disadvantaged the scope of critical inquiries as previous decades are paid scanty attention in such studies. By employing a holistic historical lens, she refuses to privilege an emphasis on post 9/11 events, which she contends has become a trend in Western academic enquiries into Pakistan. Her most important argument is her critique of the work of Saba Mahmood, an anthropologist whose book Politics of Piety: The Islamic Revival and the Feminist Subject has gained critical acclaim in the West and has arguably produced a shift in a dominant narrative that emphasised the oppressed and subjugated condition of Muslim women globally. Mahmood offered a model of Muslim women’s pietist agency based on her ethnographic study of a women’s piety movement in Egypt. She makes, amongst other claims, the argument that faith and religious activities should be read as representations of women’s subjectivities and agency and, in doing so, challenges the universality of the liberal definitions of freedom and agency. Zia critiques Mahmood’s work for its lasting effects on later scholarship, contending that by turning pietistic practices and expressions into a form of ‘agency’ that ostensibly offers an alternative to Western secular models of agency, Mahmood also “subverts the notion that women should be empowered or motivated to struggle for rights at all.” Zia warns us that this “new pedagogy on Muslim women” and the unprecedented focus on women’s religious identities it has triggered in a post 9/11 world has had two important consequences. While it has practically suppressed a serious translation of theory into actual rights for women in many Muslim societies, it has also triggered a wave of new criticism against secular feminist movements in Muslim countries on a theoretical and academic level. Zia forcefully elaborates upon her distrust of the idea that any right-wing movement, or any reading of Islamic laws, can provide a framework for women’s rights that operates beyond a protectionist and paternalistic logic. She questions the argument propagated by certain Islamist feminists that Islamic law can be accommodating to human rights principles, likening this to a plea for human rights that ultimately depends upon the generosity of interpretations of religious scripture rather than a constitutional basis for rights. Her critical examination of gendered resistance reminds us of Gayatri Spivak’s 1988 essay Can the Subaltern Speak?, which problematised the applicability of a universalist notion of agency on South Asian and other contexts. Since then, the concept of agency has been a rather formidable and often unmanageable force for scholars. Recalling Spivak, Zia cautions against the faulty conflation of resistance and agency. Her additional warning is stringent: to extract an indigenous notion of agency — in the guise of pietist or other supposedly redemptive forms — from a dangerous universalist notion, doesn’t safeguard it from being co-opted or assimilated by other forces or discourses that can be hegemonic and serve their own parochial interests. The author invites the reader to see beyond pietist forms of agency as she devotes several chapters to both collective movements and individual cases in Pakistan where women used their agency in the pursuit of secular ends, often in open resistance to religious cultural notions and religious militancy. Herein lies Zia’s contribution to the current scholarship on this subject. She directs her analytical rigour to study women’s movements that have not garnered serious attention either in academia or in the national consciousness in Pakistan. One such example is that of the Lady Health Workers Programme (LHWP), a government project initiated in 1994 that now employs over 110,000 trained women workers who deliver health services and education about reproductive health and contraceptive use to women in homes across Pakistan. Zia celebrates these women’s resistance towards a heteronormative patriarchal state on two levels. She points out that at one level they been active agents of social change in their communities. They have challenged a powerful public-private dichotomy through their mobility and influence on decisions regarding ‘private’ matters such as reproductive and sexual health in the gendered space of the Pakistani home. These contributions have also been noted by other scholars such as Ayesha Khan. Zia goes beyond current research as she draws attention to a less noted aspect of their resistance; in 2010, these women staged a country-wide protest against their negligible stipends, demanding minimum wage, regularisation of their jobs and security from harassment. Zia studies their protest as an instance of women’s framing of their own rights in a universalist, liberal light and their actions as signifying a ‘performance of secular virtues’ that stands in direct contrast to Mahmood’s depiction of ‘gendered Islamic virtues’ in other Muslim countries. Another example of a case that received neither national nor much scholarly interest is the Okara Peasant Movement of 1999. This was an unprecedented revolt in its scale and nature as peasant farmers in Okara, including a significant number of women, revolted against the military, triggered by a change in sharecroppers’ contracts which would reduce their autonomy and security against sudden evictions. Interestingly, Christian and Muslim women banded together to fight class-based oppression in a rare case of communitarian resistance. Zia uses research done by Rubina Saigol to argue that women’s participation in the consequently formed labour rights group, the Tenants Association of Punjab, has effectively reduced domestic violence in the region. Through their political activism and civic participation, these women represent another example of secular resistance against deeply embedded religious and patriarchal norms. A major achievement of this book is Zia’s use of a vast range of anthropological, political and individual case studies. Analysing sources as diverse as movements such as Al Huda and the LHWP to individual cases such as Aafia Siddiqui, and their effect on the national imagination of the archetype of the ‘Muslim woman’, this book is an ideal read for scholars interested in forming a sound understanding of the scope and history of feminism in Pakistan. For a non-specialist reader, however, the frequent and detailed inclusions of theoretical and historical background in each chapter could distract from the original and valuable insights on offer. Perhaps the greatest strength of her study, though, is how Zia is unapologetically critical in allocating responsibility for the neglect suffered by feminism in Pakistan to agents on both sides of the political spectrum. She repeatedly reminds us that, in some cases, the threat to feminism emanates as much from elite liberal circles as it does from right-wing and nationalist groups. In fact, the wide range of examples she uses places the relationship of class and gender at the centre of any serious examination of feminism and women’s activism in Pakistan, a nexus that has been understudied so far. Ultimately, she succeeds in making a powerful case for why women’s resistance and agency must be staged outside a theocratic framework. By showing that pietiest and docile forms of agency are not adequate or ultimately effective in translating into real progressive changes in women’s lives, she propels us to think more critically about many of our own assumptions and biases about women rights, notions of agency and formulations of resistance, both theoretically and in practical terms.